Last year’s lesson using the Illustrative Mathematics task Angle Bisection and Midpoints of Line Segments had plenty of room for improvement. 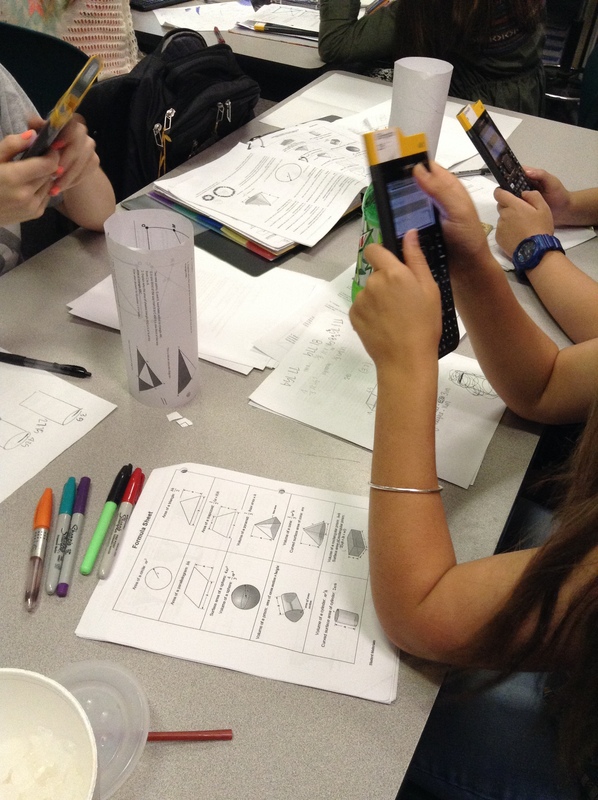 This year, students left with a better understanding of proof and giving feedback on proof. Our goal? SMP3: I can construct a viable argument and critique the reasoning of others. Students started by reading through both parts of the proof, noticing and wondering. I’ll admit, I really wanted someone to notice that parts a and b were converses. (I didn’t expect them to use that language … I was just looking for anything about the parts being “opposite”.) I wasn’t ready to tell them, so I specifically asked, “what is the difference between parts a and b”. Students spent a few minutes creating an argument for part a. Then we looked at some of the student work from last year to critique the arguments. In Embedding Formative Assessment, Dylan Wiliam suggests that students learning how to give feedback should start with anonymous student work … and eventually move towards student work from peers in the same class. This seemed to work well for this task. Additionally, I had the opportunity to purposefully select and sequence the work for giving feedback ahead of time, which gave us more time for learning during class. 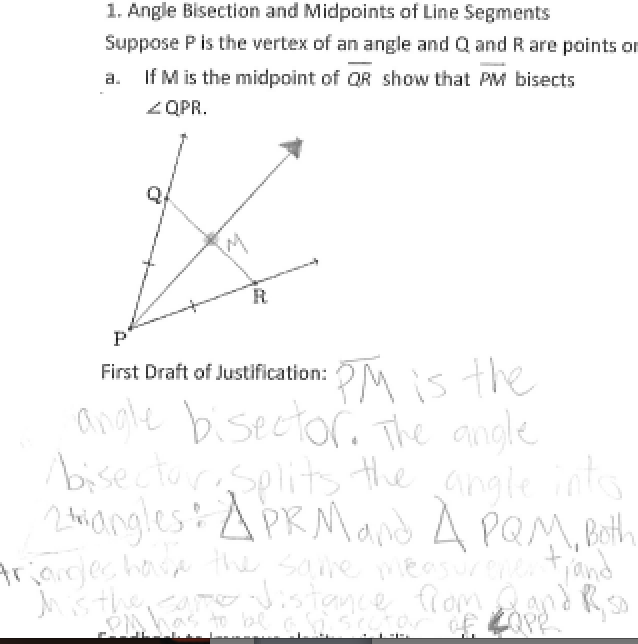 My geometry students are 1:1 this year with MacBook Airs, and so I sent a PDF of the student work samples through TI-Nspire Navigator for Networked Computers, which gave them an up-close look at the student work instead of my having to stand at the copy machine for a while or students trying to decipher from it only being displayed on the board at the front of the room. We looked at one student work sample at a time using Think-Pair-Share to make student thinking visible. What feedback would you give this student? 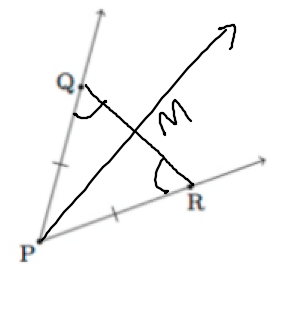 M is the same distance from Q and R, but points on the angle bisector are the same distance from the sides of the angle. 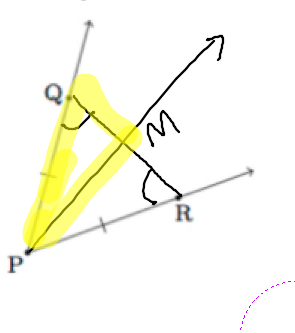 How do you know M is the same distance from ray PQ as it is from ray PR? We represent distance from a point to a line as the length of the segment perpendicular from the point to the line. 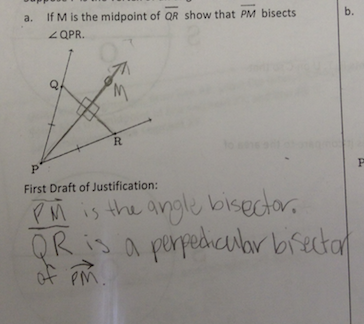 What is a perpendicular bisector of an angle? 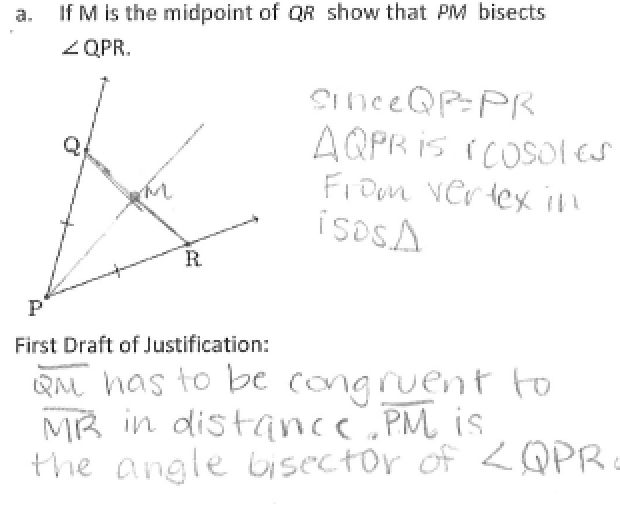 What is the difference in saying segment QR is a perpendicular bisector of ray PM and saying ray PM is a perpendicular bisector of segment PM? Before we looked at the next student work sample, I asked students to practice look for and make use of structure, asking what they saw when segment QR was drawn. The big one is isosceles. What do you know about isosceles triangles? They have two congruent angles. 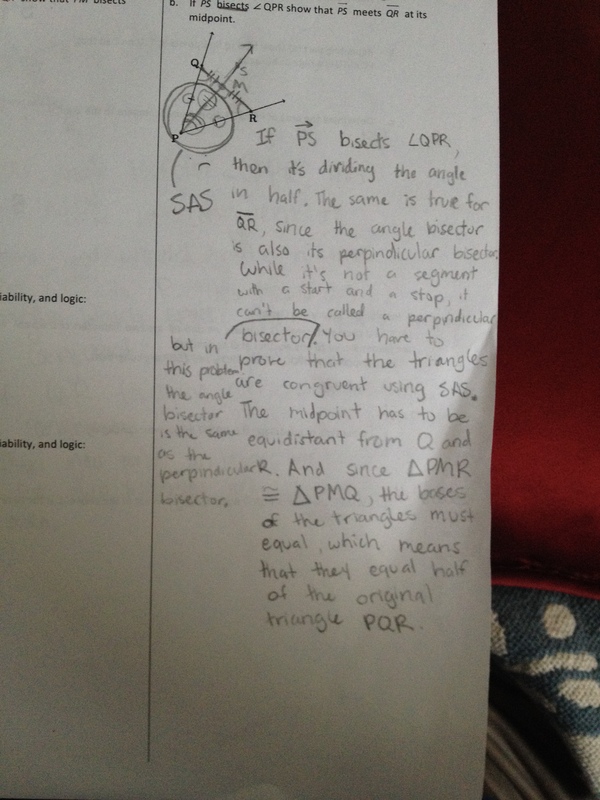 Eventually we showed that the two triangles were congruent using SAS. Then we looked at another student work sample. 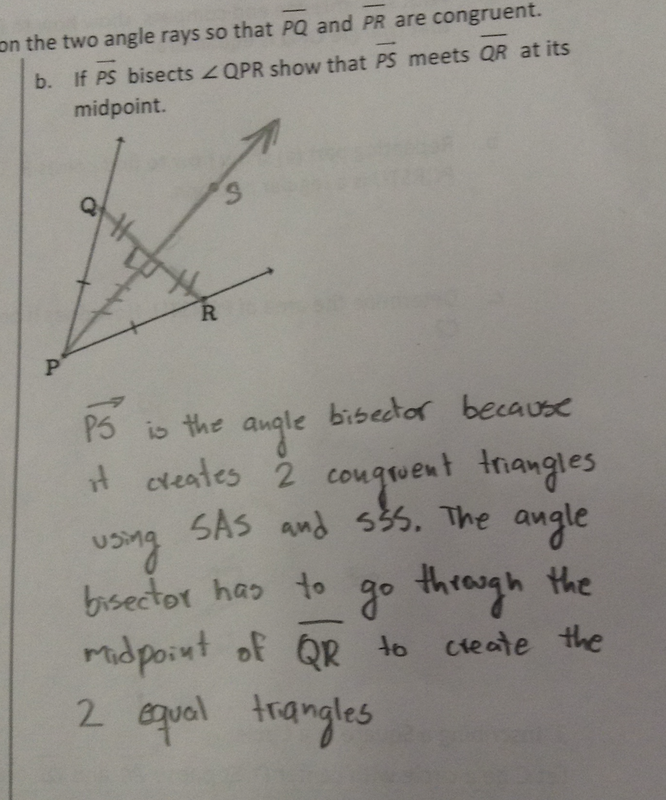 This student noted that the triangle is isosceles, but jumped from one pair of corresponding congruent sides to the angle bisector. And one other student work sample, where the student noted that the triangles were congruent, but didn’t give a reason why. 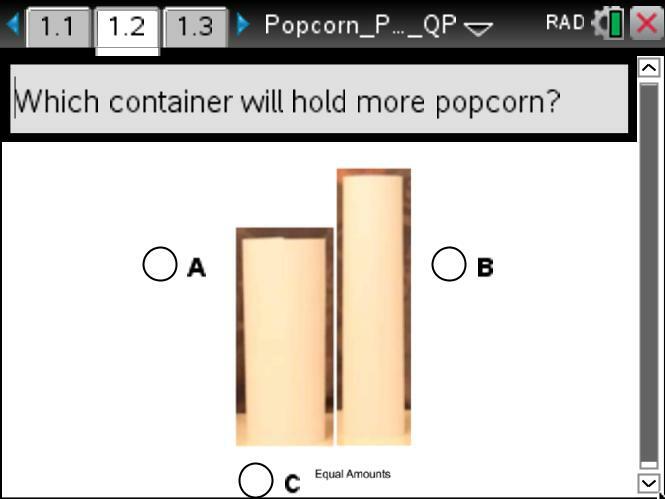 Students looked at part b for a few minutes. Then we looked at one last student work sample. What do you wonder about this argument? 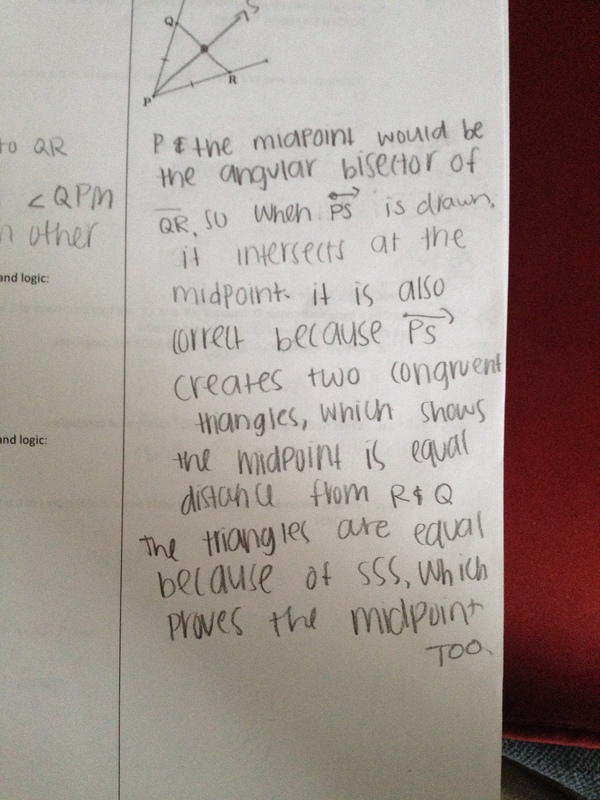 Does S have to be the midpoint? After working for a few more minutes, students gave each other feedback and then revised their argument based on the feedback. Are we going to look at a correct argument for this? Will you check mine to be sure that it is right? Last year, students didn’t care so much whether their argument was correct, nor did they care about seeing a “viable argument”. Somehow, figuring out how to improve some of the arguments for part a got them more interested in their argument for part b. We plan to look at the following five arguments tomorrow. With what do you agree? With what do you disagree? And so the journey continues … thankful for do-overs from one year to the next. I can show my work. How often do our students understand what we mean when we say, “show your work”? Jill Gough’s Show Your Work learning progression has been an important addition to our classroom. A correct solution isn’t enough … we want the reader (and sometimes grader) to understand our solution without having to ask any questions. 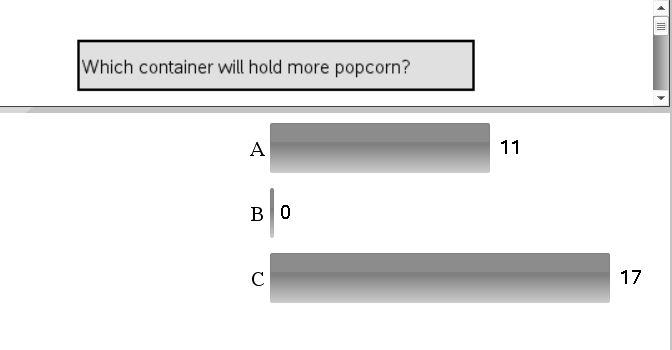 We continue to use Dan Meyer’s Popcorn Picker 3-Act, even though I keep thinking we shouldn’t need to do this in high school. The Quick Poll results, however, provide evidence that we aren’t wasting our time. You can read more about how the 3-Act lesson played out in last year’s post. 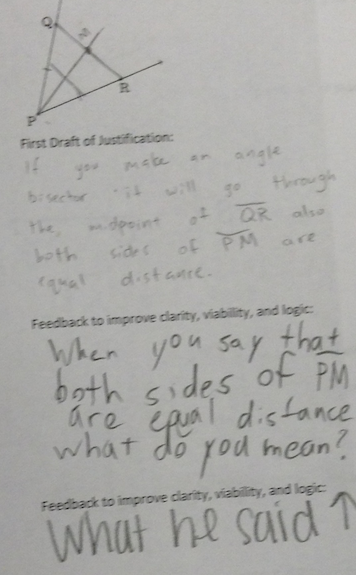 My purpose for posting about the lesson again is to consider the value added when we ask students to practice “show your work” and provide students the opportunity to give other students feedback on what they’ve shown … when we provide students an opportunity to practice SMP3, “I can construct a viable argument and critique the reasoning of others”. We used the “I like …, I wish …, What if (or I wonder) …” protocol for providing feedback. Some of the feedback that my students gave each other is helpful, but more of it is not. How do we teach students to give productive feedback to each other? Would my giving feedback on the feedback have been helpful? At what point have we spent too much time on this activity and need to call it “done”? But then how often am I so focused on teaching content that I neglect to provide students the opportunity to grow as learners? Isn’t learning how to give feedback important for all of us? The tasks we choose are so important … which ones will further both our content and our practice learning goals? And so the journey continues … with many more questions than answers. 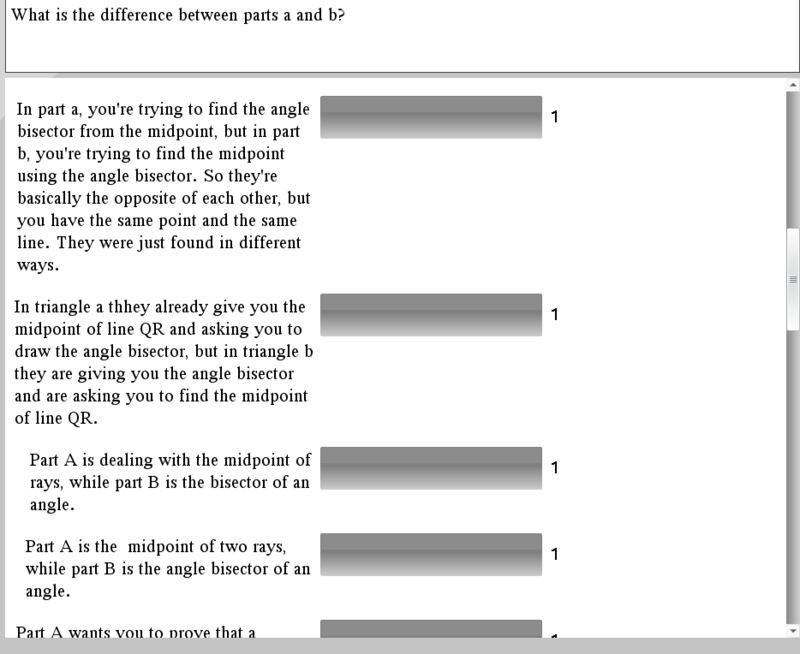 As we finished Unit 2 on Tools of Geometry this year, I looked back at Illustrative Mathematics to see if a new task had been posted that we might use on our “put it all together” day before the summative assessment. 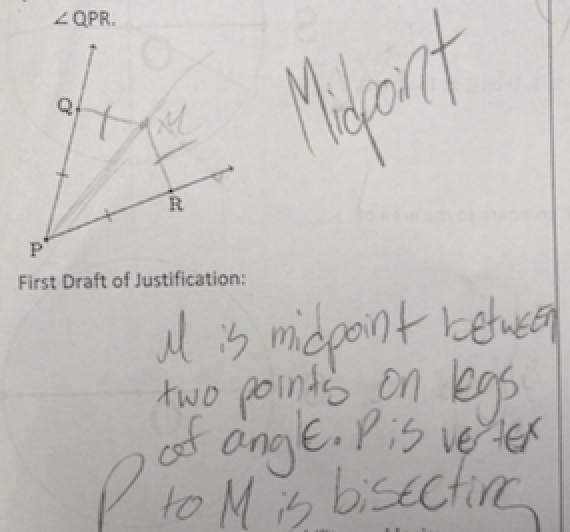 I found Angle Bisection and Midpoints of Line Segments. I had recently read Jessica Murk’s blog post on an introduction to peer feedback, and so I decided to incorporate the feedback template that she used with the task. 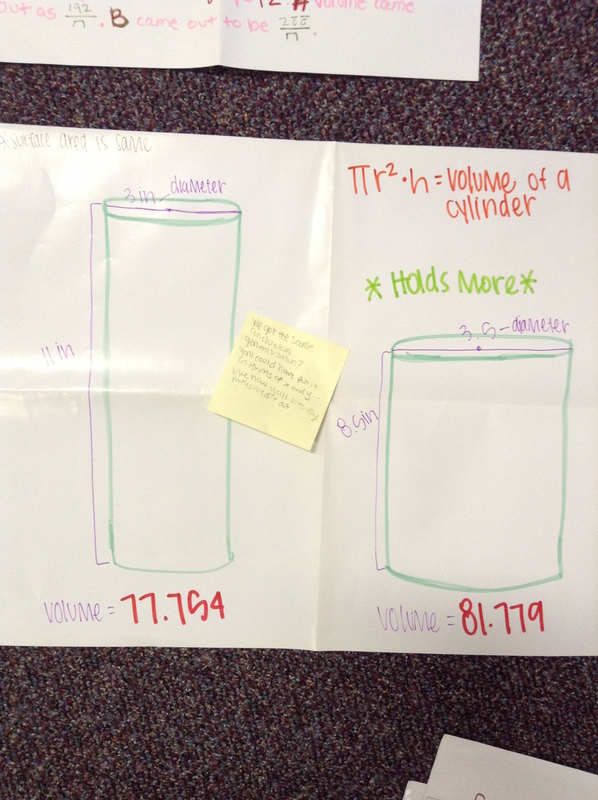 What misconceptions do you anticipate that students will have while working on this task? What can you find right about the arguments below? What do you question about the arguments below? The misconception that stuck out to me the most is that students didn’t recognize the difference between parts (a) and (b). I’ve wondered before whether we should still give students the opportunity to recognize differences and similarities between a conditional statement, its converse, inverse, contrapositive, and biconditional. We decided as a geometry team to continue including some work on building our deductive system using logic, even though our standards don’t explicitly include this work. We know that our standards are the “floor, not the ceiling”. We did this task before our work on conditional statements in Unit 3, and so students didn’t realize that, essentially, one statement was the converse of the other. Which means that what we start with (our given information) in part (a) is what we are trying to prove in part(b). And vice versa. 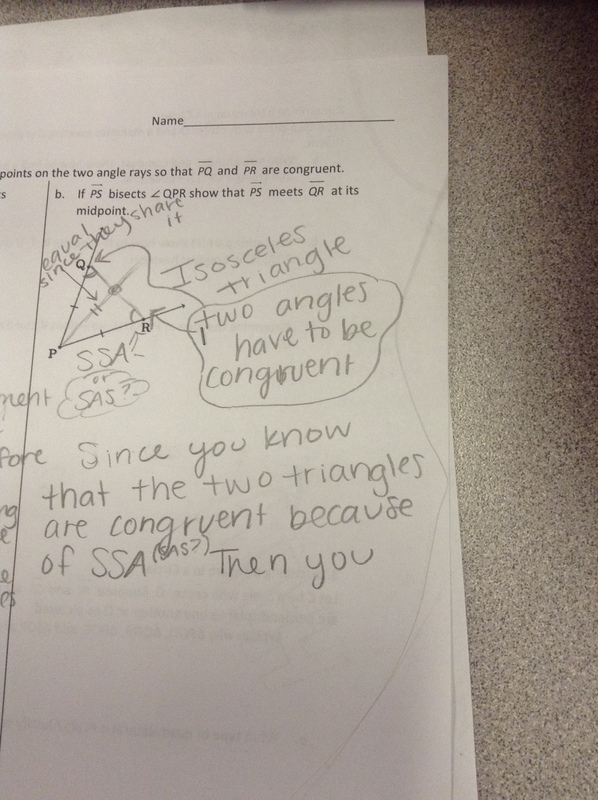 The feedback that students gave was tainted by this misconception. 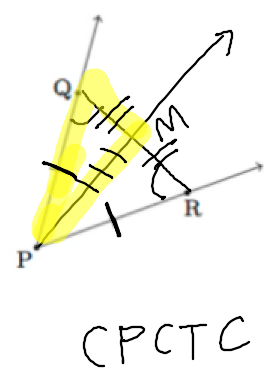 Another misconception I noticed more than once is that while every point on an angle bisector is equidistant from the sides of the angle, students carelessly talked about the distance from a point to a line, not requiring the length of the segment perpendicular from the point to the line and instead just noting that that the lengths of two segments from two lines to a point are equal. I have the Reflector App on my iPad, but between the wireless infrastructure in my room for large files like images and my fumbling around on the iPad, it takes too long to get student work displayed on the board. A document camera would be helpful. But I don’t have one. 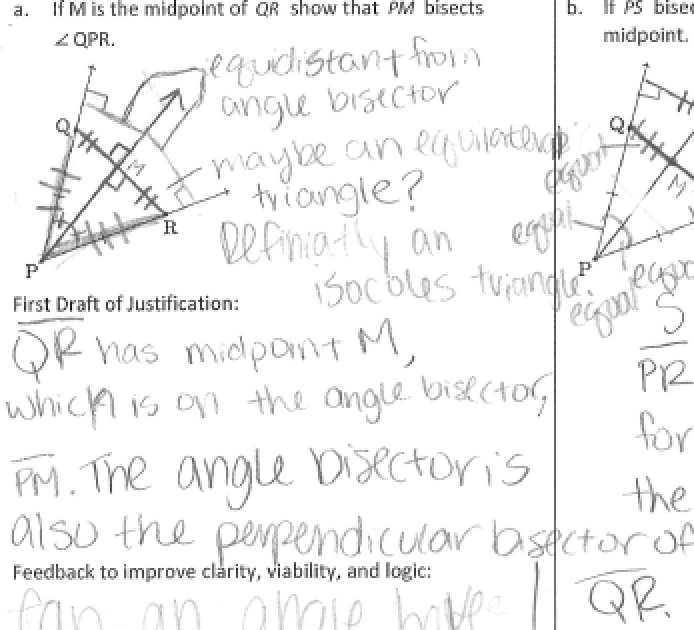 And I’m not sure how I’d get the work we do through the document camera into the student notes for the day. So I actually did take a picture or too, use Dropbox to get the pictures from my iPad to my computer, and then displayed them on the board using my Promethean ActivInspire flipchart so that we could write on them. And then a few of those were so light because of the pencil (and/or maybe lack of confidence that students had while writing) that the time spent wasn’t helpful for student learning. 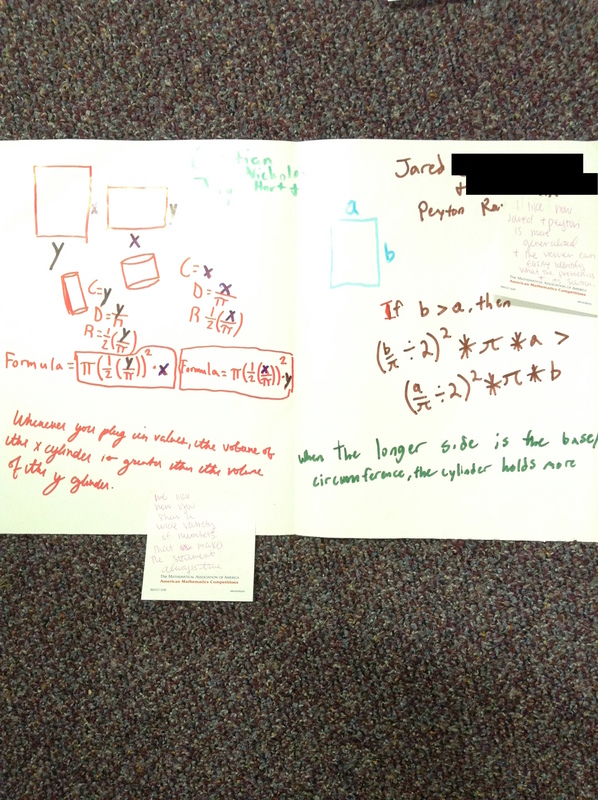 Looking back at Jessica’s post, I see that her students partnered to give feedback, since they were just learning to give feedback. That might have helped some, but I’m not sure that would have “fixed” this lesson. So while I can’t say with confidence that this was a great lesson, I can say with confidence that next year will be better. Next year, I’ll give students time to write their own arguments, and then I’ll show them some of the arguments shown here and ask them to provide feedback together to improve them. Maybe next year, too, I’ll add a question to the opener that gives a true conditional statement and a converse and ask whether the true conditional statement implies that the converse must be true, just so they have some experience with recognizing the difference between conditional statements and converses before we try this task. And so the journey continues, this time with gratefulness for “do-overs”. 2. 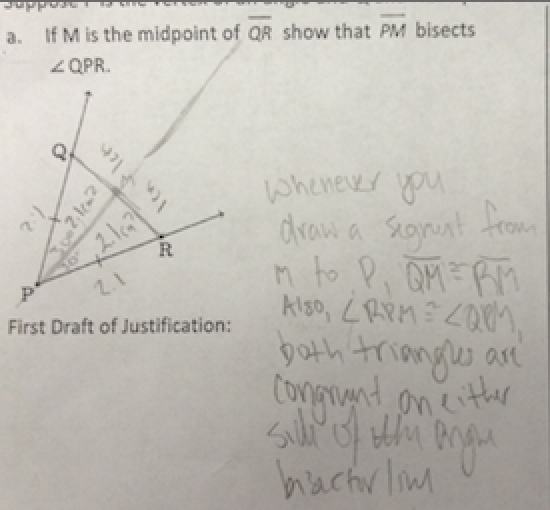 Identify and describe relationships among inscribed angles, radii, and chords. Include the relationship between central, inscribed, and circumscribed angles; inscribed angles on a diameter are right angles; the radius of a circle is perpendicular to the tangent where the radius intersects the circle. 4. (+) Construct a tangent line from a point outside a given circle to the circle. 5. 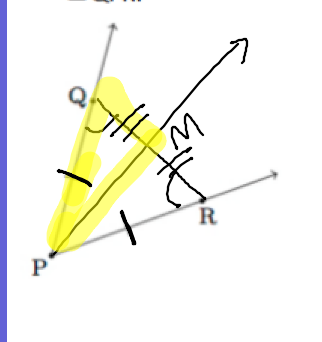 Derive using similarity the fact that the length of the arc intercepted by an angle is proportional to the radius, and define the radian measure of the angle as the constant of proportionality; derive the formula for the area of a sector. Which Standard of Mathematical Practice did you use most often in this unit? 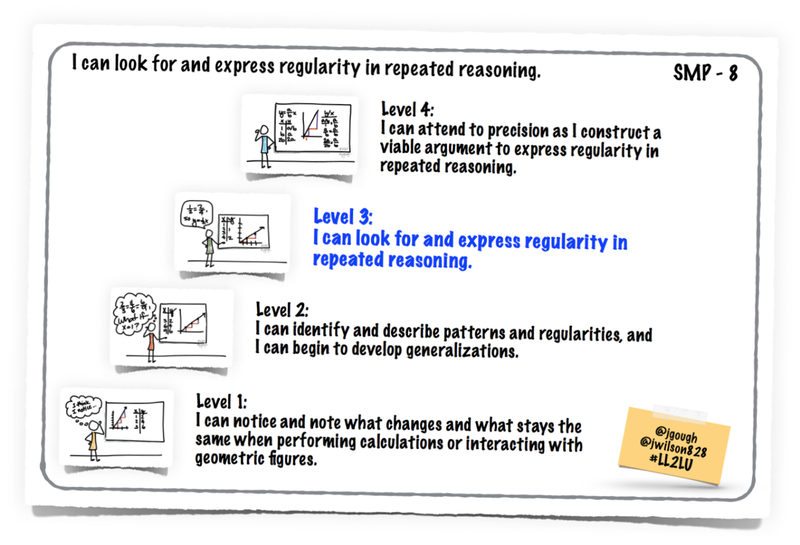 In which other Standard of Mathematical Practice did you engage often during the unit? Students answered that they used make sense of problems and persevere in solving them the most and look for and make use of structure second most. Think back through the lessons. Did you feel that any were repeats of material that you already knew? If so, which parts? The only part that was a little familiar was 8E pi. I’ve never gone in depth with circles, so no, none of the material was repeats, except maybe a few spots when we learned what pi was. 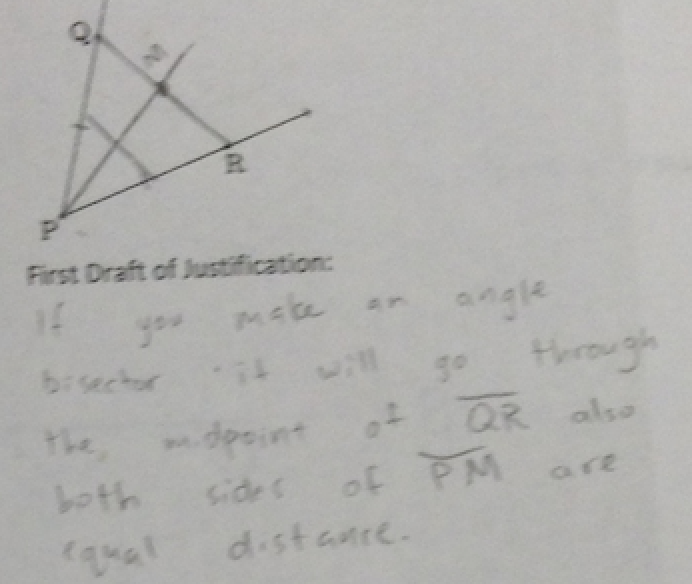 8E was a similar of a repeat of what we learned in Algebra because we had to find pi in multiple situations. It made it much easier for me to understand. Before then, I did have a small misunderstanding of what I needed, but after remembering what I had learned in eighth grade and then I was able to understand more. This was a lesson that showed me that algebra and geometry were very identical. The Pi lesson also had some repeated information, but it was nice to learn about the Pi ratio in detail. I have had little experience up until this year with circles, other than memorizing the formulas. Think back through the lessons. Was there a lesson or activity that was particularly helpful for you to meet the learning targets for this unit? If so, how? It helped me understand circles more when we used real life situations. Pi was an integral part of the unit and it helped me kind of piece things together. Finding degree measurements in a circle was like a puzzle, when you got one piece you could move on to the next. I believe the day where we thought through ways to find the center of the circle gave me insight into the relationship between the circle and the accuracy necessary to correctly talk about it. It also gave me a chance to apply what I had learned previously to find an accurate solution. All of the lessons were very helpful for the understanding of the chapter, especially 8A, the beginning lesson, which became the “backbone” for the later lessons. I think lesson 8B helped a lot because it introduced tangents and chords, which was a totally new concept for me. All of the homework activities helped me understand the unit. I find it wasn’t the lesson itself, but the homework. The homework challenged me to really think and on a few of them I had to search how to do them. It really helped me make sense of problems on the test and on the lessons after some homework. The 8H homework was actually probably the most helpful of any of the things I did. I thought I knew this unit pretty well, until I went and made a 5/10 on my first try. It really helped me go back, review, and relearn the things we’d been doing because I had some very skewed ideas about circles before that lesson. The performance assessment was very helpful to me because in a sense it was a combination of all the previous lessons. This also was a way to make myself quicker at solving the problems and figuring out short-cuts. This was a great review to prepare for my test, which I believe that really was an asset for me. The test was much better with the performance assessment. The Performance Assessment was very helpful because it let me see which parts of the unit I didn’t understand as well as the others and showed me what I needed to work on before the test. Every lesson this unit was helpful, but the Performance Assessment and the Mastering lessons helped the most. In the lessons before these, we learned a couple things, but in these lessons, we learned how to combine everything that we learned to find the correct answers to challenging problems. What have you learned during this unit? I learned how to calculate the arc length of a circle using the relationship of it to the whole circle. 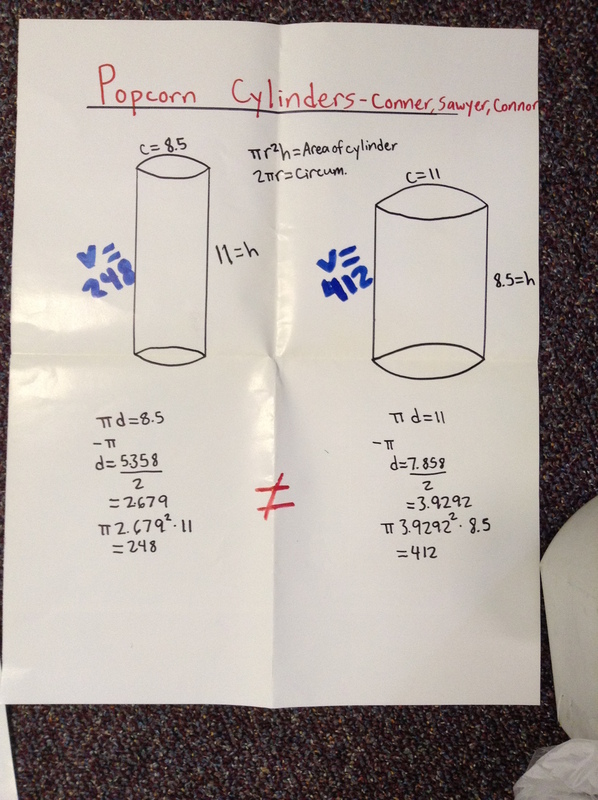 In this unit I have deepened my knowledge of Pi, which is one of my favorite numbers and how to recognize tangents. 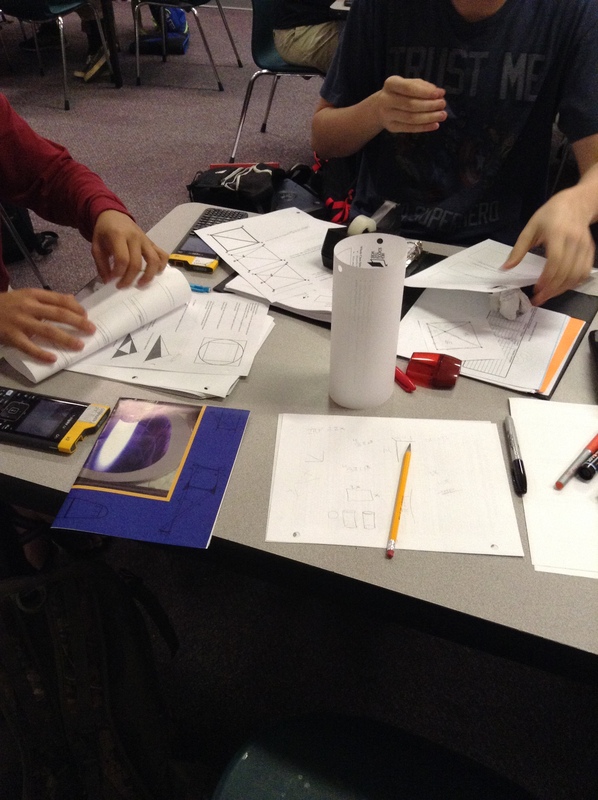 I have also learned how to find arc measures and how to find an angle measure in a circle. I have learned the relationships between radii, chords, tangents, and secants in circles. I’ve also learned so many different ways to solve for missing links within circles. I can also find missing lengths outside of the circle. I find that this unit was the toughest to this point. … I’ve also learned that’s circles are more complicated than they seem at first. 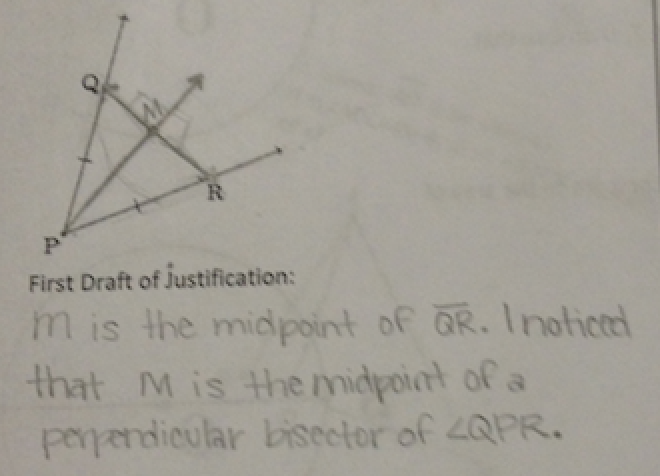 During this unit, I learned about the relationships between arc lengths and the angles that intercept them. I also learned how tangents and chords relate to circles, and how to figure out their lengths. Another thing I learned was what Pi was and where it comes from. A fourth thing I learned was how to determine the arc length and area of sectors in circles. And so the journey continues … trying to determine what is best for students. Do I take out the pi lesson next year, since students had some knowledge of pi coming in to high school geometry? 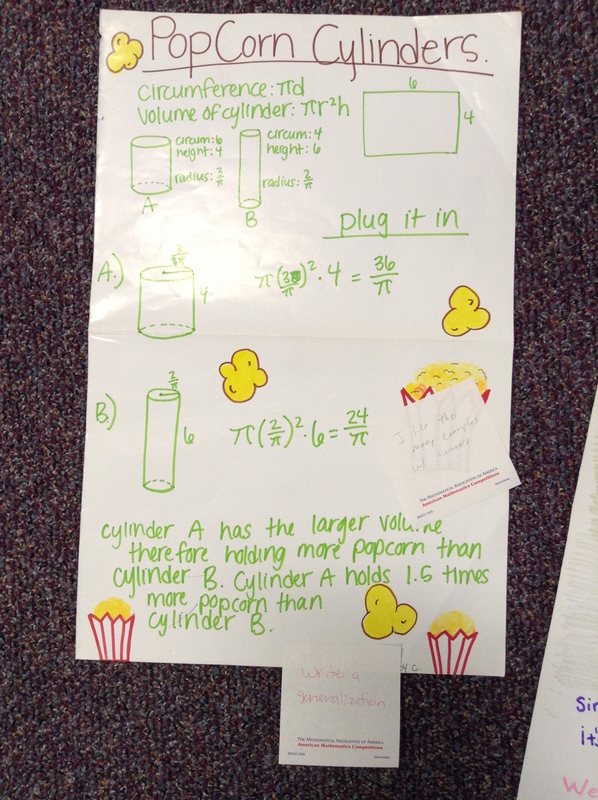 Or do I leave it, since several students noted that they enjoyed learning about pi in detail? Eventually, I’ll have students who should have an informal derivation of the relationship between the circumference and area of a circle in grade 7 (7.G.B.4), but until then, I’ll probably keep going over at least part of the lesson. I created a survey in our Canvas course for students to reflect on what they had learned in this unit. Level 1: I can identify and define transformations and composite transformations. 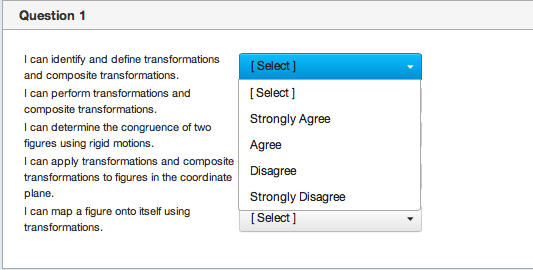 Level 2: I can perform transformations and composite transformations. 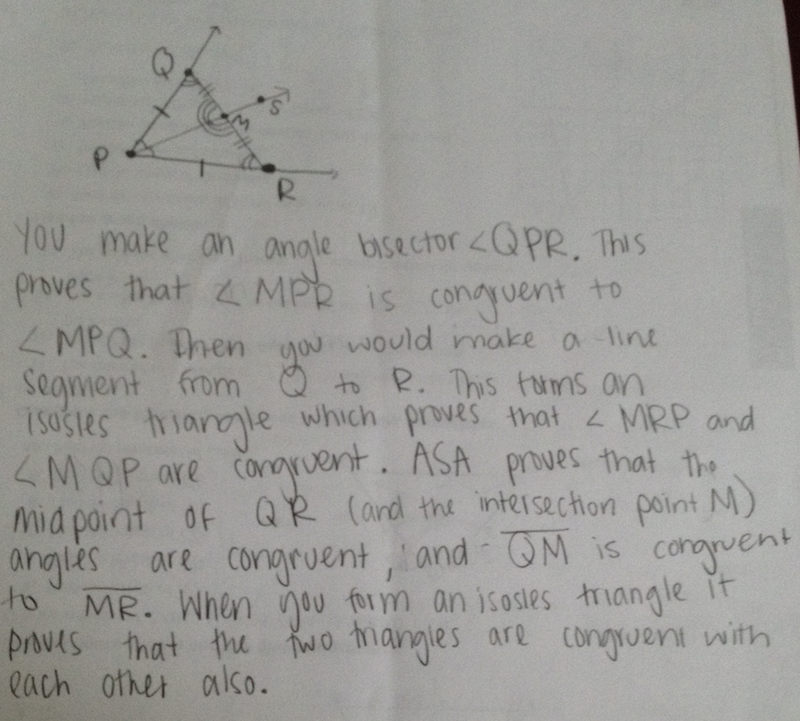 Level 3: I can determine the congruence of two figures using rigid motions. Level 4: I can apply transformations and composite transformations to figures in the coordinate plane. 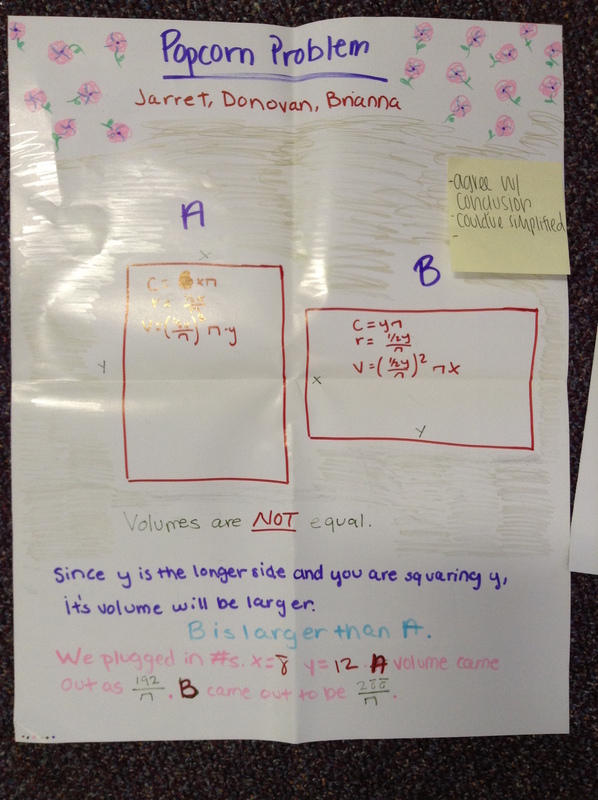 Level 4: I can map a figure onto itself using transformations. Every student answered “strongly agree” or “agree” to each of the I can statements. We focused on learning math using the Standards of Mathematical Practice. I asked students which practice they used most often during this unit. 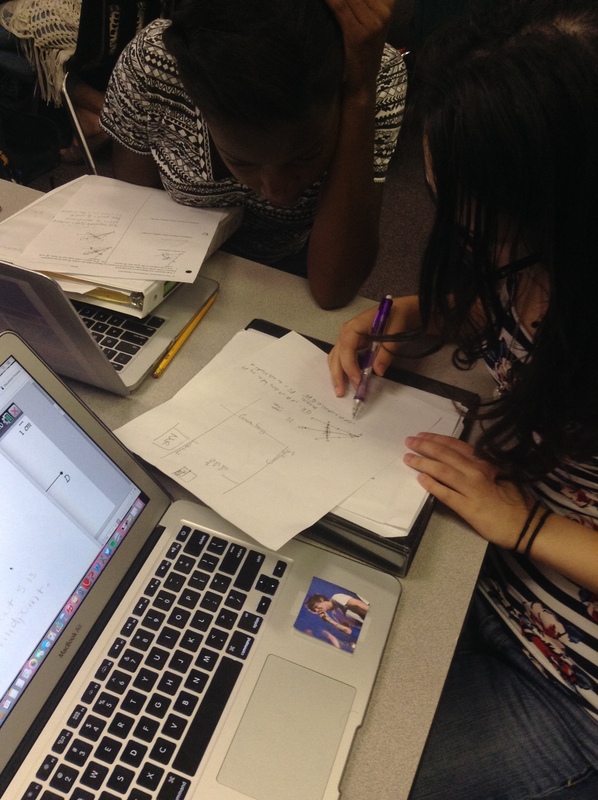 55% of students said that they most used make sense of problems and persevere in solving them. The students have some experience with transformations in middle school. Could they tell that we were deepening their understanding of rigid motions? Did any of the lessons feel like repeats of material they had previously learned? None of them were complete repeats because I learned about them more detailed than before. Before now, I had a very general knowledge of transformations, but actually putting this knowledge to practice was new. I had already learned most of the basics of transformations. I knew reflections were flips, translations were slides, and so on and so on. However, I’d never gone in depth with the mathematical reasoning behind these transformations and their causes and effects, which brought a whole new light on the subject. I believe that the basic ideas of 1A-E I knew but I still had room to grow on the knowledge these subjects. I felt that I already knew how to do translations and reflections, but in this unit, I noticed new things about them such as that a reflection changes the orientation of the pre-image and that a translation keeps the same orientation as the pre-image. I also knew about rotations, but I wasn’t great at actually preforming a rotation. Most students answered that What’s My Rule was most helpful. Several others noted that the lesson on Rotations was helpful. I learned how to really think about math differently. I learned to double check my work- A LOT. I learned how to tell counterclockwise and clockwise apart. I learned translations and how they move, reflections and how they work, and rotations and how they twist. I learned about matrices and how complex they can be, although I’m still a little confused (I think I have it, but I’m not so sure). I learned the first parts of geometry. I have learned how to reflect a figure across the y=x line and the y=-x line. I learned how to map figures onto itself and reflect on lines other the the x and y.
I learned some formulas to help with reflections. I also learned what directions a figure should be rotated if I’m only give the degrees to rotate. I learned how to see if shapes on a coordinate plane are congruent, and how to map something onto itself using rigid motions. A lot of things in this unit were repeats of what I have learned in the past, but there was so much more that I didn’t know about all the transformations. For one, I didn’t even think about the distance from each side to the line of reflection in the past. 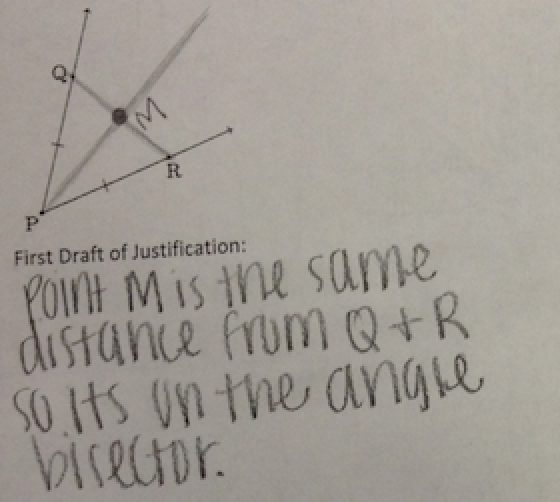 I just knew the simple things like the points were congruent. I’ve learned a lot and couldn’t type it all. People who don’t learn anything within a whole unit are crazy because you can always learn something even if it’s just a small little thing. I would say that I’ve decided not to give up on hard problems like I would in the past. I didn’t really learn that, but I think it’s important to geometry and, really, everyday life. I wonder (maybe too often) whether what we are doing in class is important. 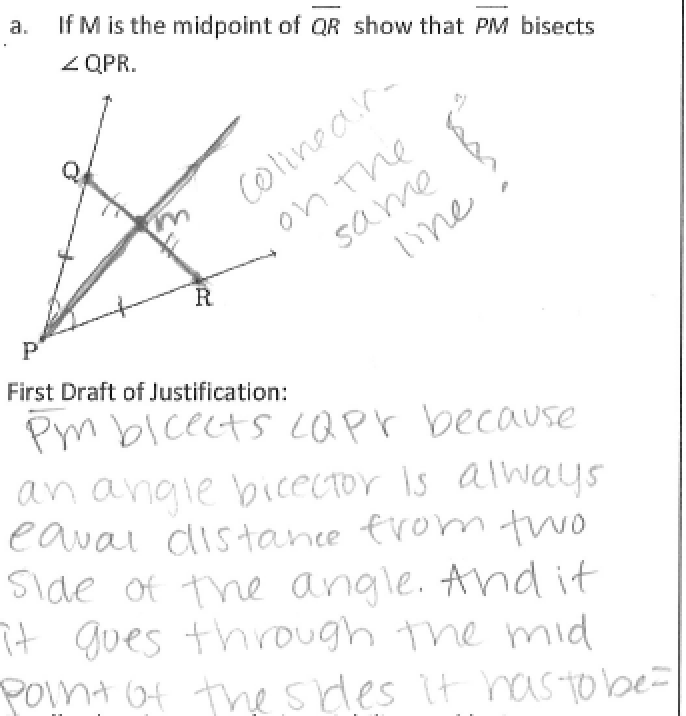 The student reflections give me evidence that my students are recognizing new content and also connecting it to what they knew before our high school geometry class.